Preheat oven to 400 degree. Line a rimmed baking sheet with aluminum foil. Bring a large pot of salted water to a boil over high heat. Add pasta, and cook according to package directions. Drain and keep warm. Spread tomatoes in a single layer on prepared baking sheet. Drizzle with olive oil, stirring to coat. Add garlic to pan, stirring to combine. Bake, stirring halfway through, for 20 to 25 minutes or until tomatoes begin to burst. 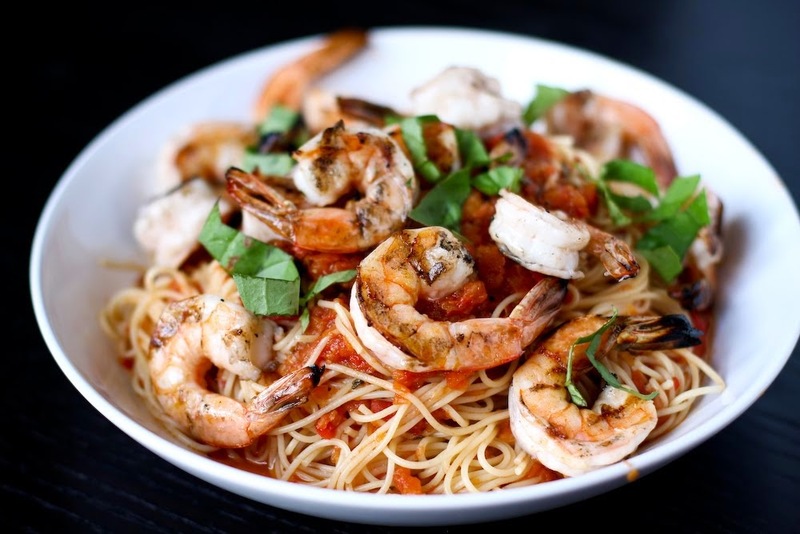 Add shrimp to tomato misture, and bake for 3 to 4 minutes or until shrimp are cooked through. Add vinegar, sugar, and salt to shrimp mixture, stirring well. Spoon over cooked pasta. Top with goat cheese and parsley, tossing gently to combine. Serve.